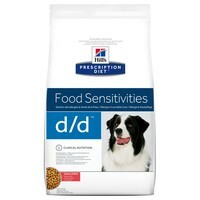 Hills Prescription Diet DD Food Sensitivities Dry Food for Adult Dogs is a complete and balanced diet for the management of dogs with food and nutrient intolerances. Developed to support your dog’s skin function in cases of dermatosis and excessive hair loss, Hills D/D has been made without many of the common ingredients known to cause allergic reactions and reduces the risk your dog will react to this diet. Very good for our 12 year old dog, always had a sensitive stomach and now has no problems, would recommend DD.